When Ben goes away on a work trip and leaves me to my own devices for a week, actual meals go out the window and get replaced with bowls of melon. Followed by bigger bowls of ice cream. Which is actually kind of balanced, so get up off me, okay Mom? Just kidding. My mom loves ice cream. 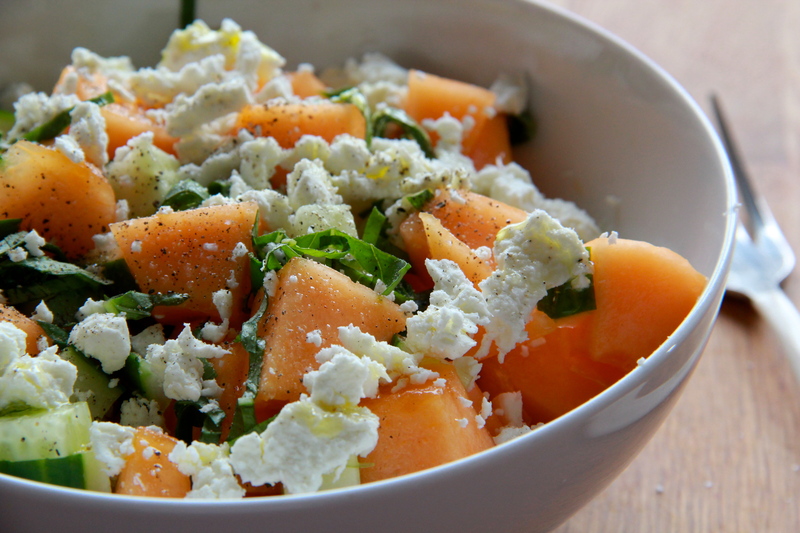 Melons are SO good in the Bay area right now. I’ve been into the crenshaws, but there are plenty of great varieties to choose from. Honeydew. Casaba. Charantais. Juan Canary! (These aren’t made-up things, I’m 97% sure.) They’re piled high at the markets, firm and full of color, super sweet and heavy with juice. 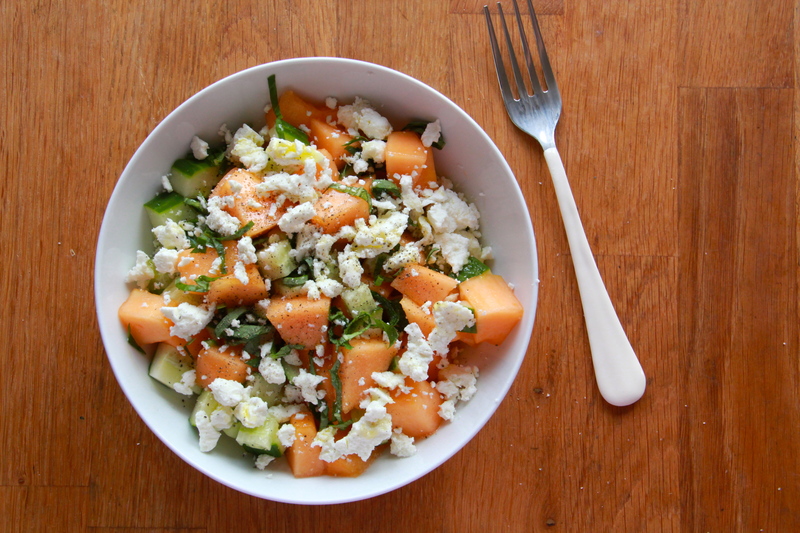 Tossed with some crunchy chopped cucumber, a handful of creamy goat cheese and a bit of bright basil, a bowl of melon turns into a pretty respectable meal. Real simple. Real sweet. Real good. Just like summer! 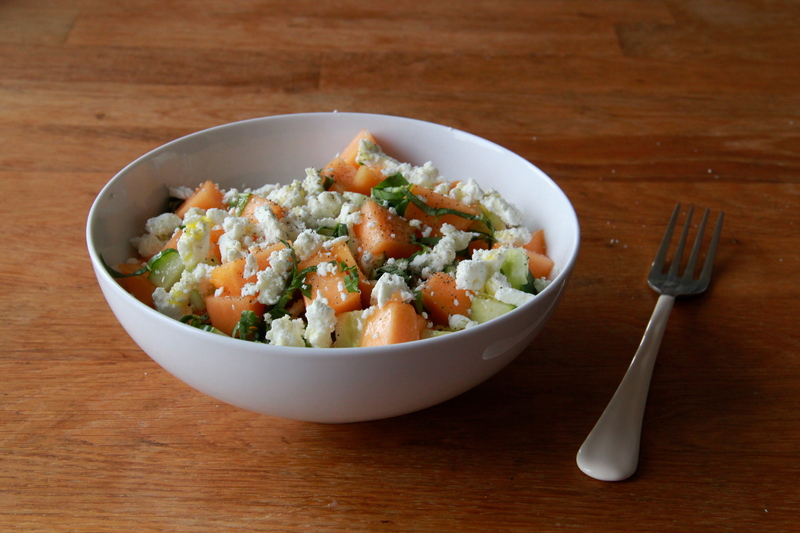 In a large bowl, toss together the melon and cucumber. Add the goat cheese, basil, salt and pepper, and drizzle with olive oil. Toss gently. 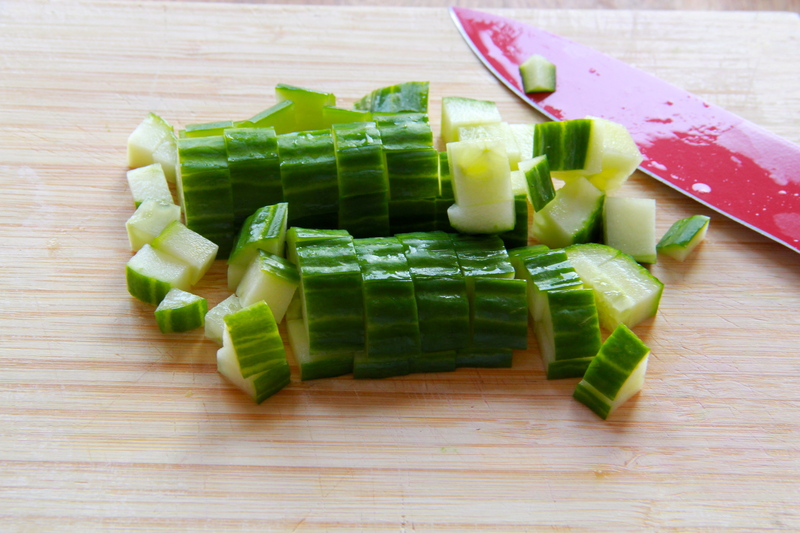 Enjoy immediately, or chill for a few hours before serving. Served to some of our favorite Lake Tapps guests…which included a young couple named Jon and Octavia…added fresh squeezed lime juice…quite tasty and so pretty! First, that looks super delicious 🙂 Second, when my husband goes out of town, like he is right now – I do things like eat popcorn for dinner followed by ice cream. Followed by a cocktail. But I figure, at least I waited until my kids went to bed!